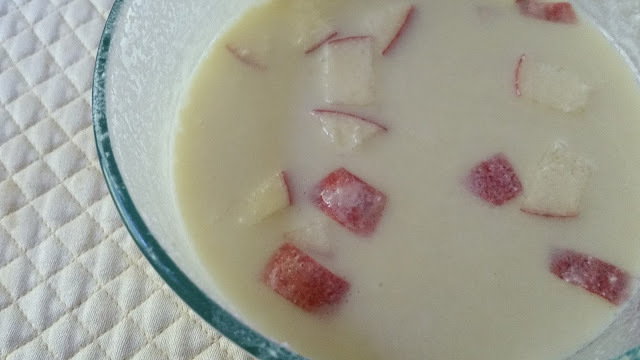 Ajo blanco (gazpacho blanco or gazpacho a la Malagueña [Malaga-style gazpacho]), made with almonds, bread, garlic, Sherry vinegar, salt and water, usually garnished with green grapes, sometimes with diced apples, as shown here. Ajo blanco has the appearance of a bowl of the whitewash that is used to keep houses white in many parts of Spain, but this dish is one of the greatest folk dishes of Spain. The juxtaposition of the texture of the ground almonds and bread, garlic, vinegar and salt with the tart sweetness of the grape or apple garnishes makes for a compelling dish, whose flavors are addictive. Photo by Gerry Dawes©2015 / gerrydawes@aol.com / Facebook / Twitter / YouTube / Pinterest. Samsung Galaxy S5 Phone Camera 16MB.